Read Teddy’s story in Annette’s words and see another cute photo. 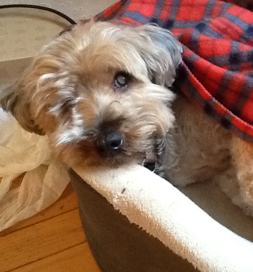 None of this sounds outstanding – lots of dogs can do these things — until you learn that this five-year-old Yorkshire Terrier/Poodle mix has had his right eye removed due to glaucoma and has lost all vision in his left eye. Annette found the Blind Dog Rescue Alliance through Petfinder and saw Teddy listed. “I began sending Teddy’s information by email to my husband,” she says. Teddy’s foster mom told Annette that Teddy was an Alpha dog and would do best with no small children or other animals. So far, so good because the Hanagans only had three guinea pigs (which were safe from a small dog) and three teenagers. The home visit went well, so the adoption was approved. The family loves Teddy, and and he loves them right back. He lucked out when he became a Hanagan. And the Blind Dog Rescue Alliance had a bit of luck, too, because Annette became a BDRA volunteer.